Rock & roll was born reciting its own myths: take Chuck Berry turning “Johnny B. Goode” from autobiography (changing “colored boy” to “country boy”) into the Elvis legend. Yet cynicism about rock & roll fame was there too, like Bobby Bare’s take on Presley’s rise, “The All American Boy.” (“I picked my guitar with a great big grin/and the money just kept on pourin’ in.”) By the mid-’60s, as rock music became a cash-bloated, multi-national business, the Stones were mocking industry pissants (“Under Assistant West Coast Promotion Man”). The Byrds, folkies who saw A Hard Day’s Night one afternoon and decided to become rock stars, offered “So You Want to Be a Rock & Roll Star,” where selling out to The Company is simple, absurd and inevitable. Bowie’s “Star” is descended from these songs, but something is off—it’s more earnest and yet more false. It could be a number sung by a teenage girl in a Broadway show, it could be a paying-your-dues anthem by a metal band. “Star” has no sense of reality, of rock & roll as a business: rock stardom is a fairyland contrasted to the weary business of politics or art. The singer sees his friends commit to activism or violence (like Tony, who goes off to fight in Northern Ireland) and decides he’s not cut out for sacrifice. Instead he just wants to be a rock & roll star, which seems easy enough. “So enticing to play the part,” the singer imagines, pouting into the mirror. Bowie wrote “Star” (originally called “Rock & Roll Star”) in late 1970 or early 1971 and offered the demo to a group from Princes Risborough called Chameleon. (Chameleon’s version was never released.) According to Nicholas Pegg, Bowie had forgotten the song until a gig in Aylesbury in September 1971, when someone asked him about his “rock & roll star” piece. 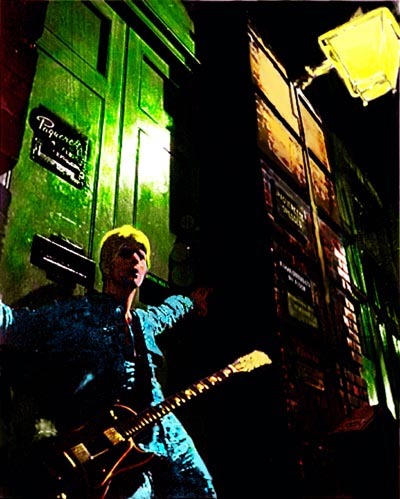 Bowie was drafting the Ziggy Stardust storyline (well, what there is of one) and saw that “Star” would fit perfectly. He slotted it between “Lady Stardust” and “Hang Onto Yourself.” It works—“Lady Stardust” is Ziggy as seen on stage; “Star” is Ziggy’s fantasies and ambitions; “Hang Onto Yourself” is what he performs. Like many Ziggy Stardust tracks, “Star” has echoes of older songs. The intricate multi-tracked backing vocals were inspired by the Beatles’ “Lovely Rita,” Bowie said later. Most of all, it’s in debt to the Velvet Underground’s “Sweet Jane”: the opening verses of both songs are populated with characters off in the real world (“Jack, he is a banker/and Jane, she is a clerk” v. “Bevan tried to change the nation/Sonny wants to turn the world”) as contrasted to the singer, who’s in a rock & roll band. The studio take of “Star” is built to be relentless: it’s a series of eight-bar verses, choruses and bridges glued together, underlaid with a hammering piano track (reminiscent of John Cale on early VU tracks) and filled with Mick Ronson’s interjections on guitar. It ends in a long outro, where the tempo slackens, two harmonized guitars briefly appear, and Bowie mutters and whispers, turning the fantasy ominous in its last moments. This entry was posted on Thursday, April 15th, 2010 at 9:54 am and is filed under The Rise and Fall of Ziggy Stardust and the Spiders From Mars: 1972. You can follow any responses to this entry through the RSS 2.0 feed. Both comments and pings are currently closed. You could probably add this version as well. From the Stage album itself.